The spinor calculus employed in general relativity is a very useful tool; many expressions and computations are considerably simplified if one makes use of spinors instead of tensors. Some advantages of the spinor formalism applied in the four-dimensional space-time of general relativity come from the fact that each spinor index takes two values only, which simplifies the algebraic manipulations. … Spinors for spaces of any dimension can be defined in connection with rep- resentations of orthogonal groups and in the case of spaces of dimension three, the spinor indices also take two values only, which allows us to apply some of the results found in the two-component spinor formalism of four-dimensional space-time. The spinor formalism for three-dimensional spaces has been partially developed, mainly for spaces with a definite metric, also in connection with gen- eral relativity (e.g., in space-plus-time decompositions of space-time), defining the spinors of three-dimensional space from those corresponding to four-dimensional space-time, but the spinor formalism for three-dimensional spaces considered on their own is not widely known or employed. 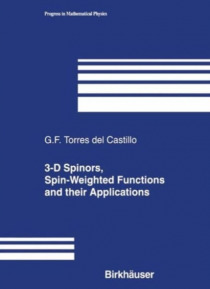 One of the aims of this book is to give an account of the spinor formalism for three-dimensional spaces, with definite or indefinite metric, and its applications in physics and differential geometry. Another is to give an elementary treatment of the spin-weighted functions and their various applications in mathematical physics.